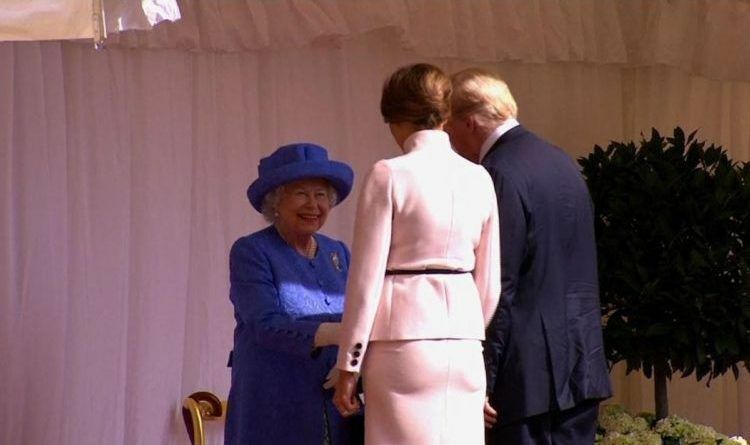 July 14, 2018 July 14, 2018 Alex Hall 13241 Views 8 Comments Donald Trump, Great Britain, Make America Great Again, Queens, Royal Family, Royal Visit, U.K.
Trump’s “America First” foreign policy has scrambled alliances between the United States and the countries that traditionally have been its closest allies like Great Britain! Well, it seems that his policy works and the people of the United States love his attitude toward countries that used the U.S. as piggy banks! Today he shows to the world who is in charge and the queen was obviously caught by surprise! Donald Trump kept the Queen waiting for more than 10 minutes for the arrival of the black Range Rover used to transport him and his wife Melania to Windsor Castle. And at one point Mr. Trump appeared to breach the royal protocol, marching in front of the Queen while they inspected the guard of honor. The President looked out of step with the official choreography – causing the Queen to point tentatively and ask him to move to the left. Out of USA our President is different, he is strong, he says what he means & means what he says. The people love him & voted for him because he is different. It probably gave the queen something to think about & to remember in the days to come. I would believe that she really likes President Donald J. Trump. Yesterday President Trump gave a bombshell interview to The Sun that published Thursday evening in which he criticized May’s Brexit strategy and implied that former foreign minister Boris Johnson would make a better prime minister. Do you think that President Trump was right and that he showed to the world who is number one? ← Melania’s Inspiring Message After Meeting The British Army Veterans Will Melt Your Heart!